We see you! All of you beautiful girls in our 435 Collection, you are absolutely rocking it, and we love, love, love your unique looks! Your one-of-a-kind style is exactly what inspires us every day to bring you pieces to mix, match, and truly make your own. Q: What inspired this fun new collection for tweens? A: This new summer collection was really personal for me. I was thinking about my own tween nieces and what they like to do and wear in the summer. I wanted to give our girls pieces they could move and run around in and just feel good. Q: Can you tell us about the athletic-inspired pieces we are seeing (and loving)? A: The athletic trend is everywhere – and we definitely wanted to give it to our tweens in a fun way. 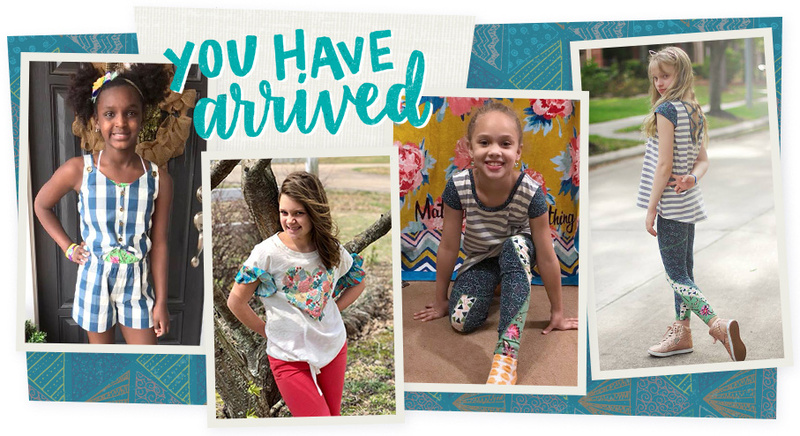 Like with the leggings … we know she loves leggings, and we made ours extra special with the color blocking (that we’re really good at) and with fun details like the cover-stitch detail in a pop color and the feminine floral print at the ankles. Q: What about the heart tee – what’s the story behind this one? A: We really wanted to give our girly girl something special – and this tee is it. The heart graphic – created by our own in-house designer, Maggie – is so pretty. The ruffle sleeves and tie at the waist make it super fun, too! Q: How do you hope these pieces make the girls who wear them feel? A: I just want her to feel really good. We tried to give her the trends she’s seeing – like the cutout details and the strappy backs – but in a very Matilda Jane way. We want her to feel super cute … and super confident and totally comfortable – totally her. Posted in 435,IRL,Spring 2018,Wish You Were Here! I love these styles. This season is one of the beat I’ve seen yet from the prints to the design it will be one of the best talked about for years. Hi everyone! I’m so excited to finally be able to give you a first look at our April Collection – Wish You Were Here! For us, April really kicks off our summer season, which is always one of those releases that’s so fun to design. And for this release, that was especially true as we found our inspiration in this idea of a classic family vacation. When we started to design, we were all planning our own family vacations, which was perfect. And we drew inspiration from our own childhood memories, too. Lara brought in pictures of this grand hotel in Michigan she used to go to as a girl with her family, and we just all fell in love with the bright, playful colors and the mixed-and-matched vintage prints and all the sweet little details and touches. Our color palette this time is so fun – really sunny and summery. There’s a really bright yellow we’ve never done before, but it’s so great. It’s just like the sun shining – it just makes you feel happy. As far as styles, we wanted to give everyone what they needed for every part of vacation. I know when I’m packing my own girls, I like to pack a special dress for dinner, something comfy to run around in during the day, and of course their cutest P.J.’s for those late-night pajama parties with cousins. 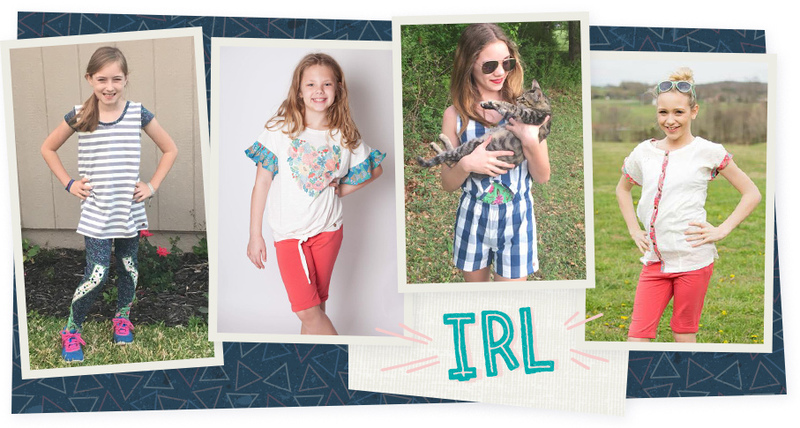 There’s so many new pieces we just love so much – including some really exciting styles for tween! 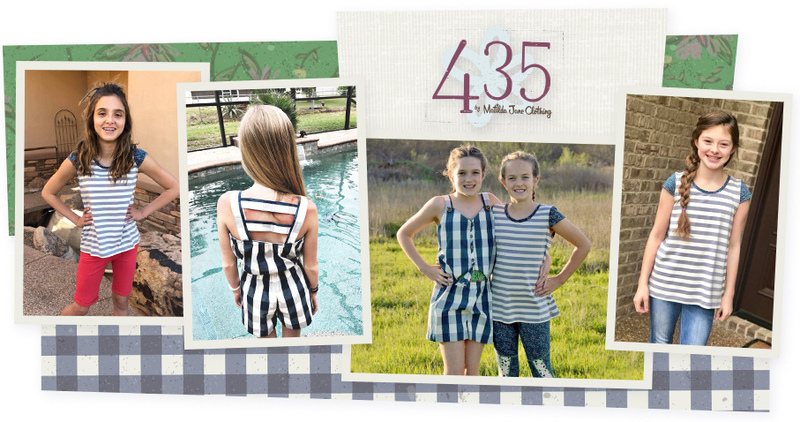 My own girls wear our 435 Collection, and I really wanted to give them the trendy styles they want … but in an MJ way of course! They can’t wait to get their hands on this gingham romper we’re doing. It has the most-fun faux peekaboo cutout details – so cute! Another thing we’re really excited about is baby. As you know Meagan recently had a little baby — and those tiny fingers and toes just melted our hearts. So we thought, why don’t we do little baby? So we are! All our baby styles, including some new layette-type styles, are going to be available in sizes 0-3 months with this release! That’s not the only surprise either. We have some amazing women’s styles (some brand-new silhouettes, some returning favorites), new home arrivals, and a promo we’re pretty sure you are going to love. I can’t wait for you to see it all. Wish You Were Here arrives April 3! Posted in Summer 2018,Wish You Were Here! Hi Matilda Jane! Random thought, but I LOVE the MJC backpacks. If you decide to make some more for the 2018 back to school season, could you make some big enough for Jr. High/Middle School and High School? I found Matilda Jane when I googled “who designs the Gaines girls’ clothing?” I just love that family and have always loved how precious Ella and Emmy Sue look. As a designer myself, I appreciate seeing fabrics and trims joined and combined to make clothes that seem to be one of a kind. Who wants to dress or dress your kids like everyone else does? I used to love being at at event and seeing a little girl wearing one of the creations I designed and sold through The Blue Daisy Boutique in Lake Grove, Oregon. I still have a beautiful stash of fabrics that would lend themselves to making this type of clothing for kids and am hoping I have the chance to do so while I’m still on this earth. Christa, our models are in a couple different brands of sandals, if you can let us know which shoes you were loving we would be happy to pass along the brand. Thank you! Matilda Jane is the Bomb! I was wondering if someone could tell what sandals the little ladies are wearing in thr latest release? I can’t wait for April release!! It all looks so pretty! One thing that we undoubtedly adore here at MJC is creativity. From concepting a new season to bringing it to life, our team members just love playing in our Matilda Jane playground to create the most whimsical and sweet designs a gal can find! And we always love inviting YOU to join the fun. Our models had the best time creating their own DIY dreamcatchers at our last photo shoot, and we thought it was the perfect activity for your cuties! The supplies are simple, and the options are endless when it comes to making it your own. Dreamcatchers are often used in Native American culture to protect people and mainly children from bad dreams or nightmares. Although they are usually made of a woven string web around a willow hoop, we thought the supplies above would be just the perfect pieces for you and your kiddos to have a little fun. You can add lots of texture and variety to your dreamcatcher by choosing various colors, ribbbons, fabrics, tassels, and yarns. Be sure to check out the instructions below to get started today. step one. Tie your yarn around one end of the hoop and tightly wrap it around your embroidery hoop. You will want to secure your yarn/string every so often with a dab of glue so the pieces don’t slip around. step two. Once you are finished with your yarn design inside the embroidery hoop, knot your string around the hoop and add a little glue to hold it tight. step three. Now it is time to add the sweet decor at the bottom of your dreamcatcher. Find your favorite pieces of ribbon, tassels, beads, yarn, and more to add a little something special to hang from the bottom. Let’s see how creative you can be! step four. Top it off with a little tie on top to hang it in just the right spot and enjoy! I love to show you her pictures. How. An I send them to you ?